View in photo was taken from One International Place. BOSTON’S SEAPORT District is in the middle of an odd moment. The neighborhood’s transformation from abandoned waterfront railyard to Boston’s new downtown has been decades in the making, and it’s happening on a scale the city hasn’t seen since the creation of the Back Bay. But it’s already being written off as a missed opportunity. Of course, it’s far too soon to pass final judgment on the neighborhood. 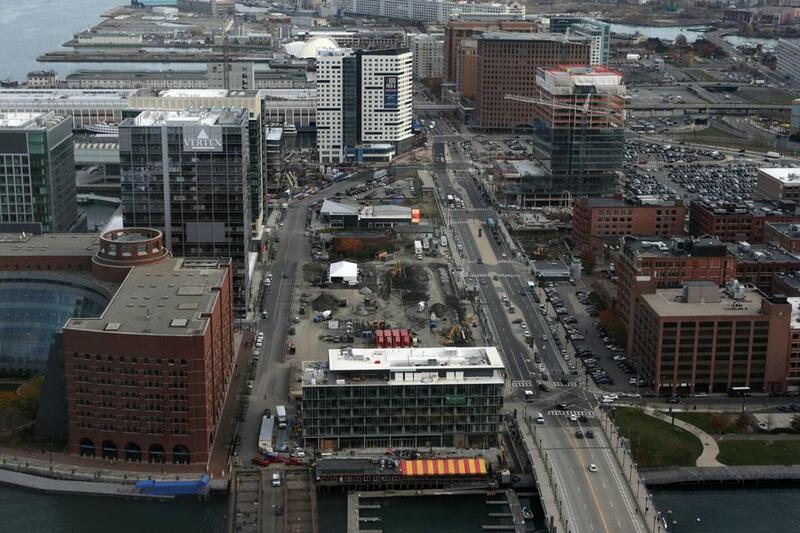 The real Seaport is only just beginning to emerge, and it’s coming into its own at One Seaport Square, a huge residential and retail complex that’s rising across the street from the Moakley courthouse. The project broke ground last month, and it’s here, at an old parking lot, that the work of turning the district into a genuine city neighborhood will happen. There’s plenty to gripe about in the Seaport today. The neighborhood is struggling with traffic woes, even if it is still too empty for its own good. Development has happened in physically isolated bursts, leaving clusters of buildings surrounded by broad stretches of surface parking lots. The buildings that are up are mostly glassy, boxy, and bland. It feels like a version of Houston that got squished down; height limits connected to Logan Airport flights have left the buildings half as tall as they want to be. Here’s a dirty secret, though: Uninspired architecture, on its own, is rarely enough to break a neighborhood. Good architecture matters, but so does what happens inside and around the buildings. So even if the Seaport’s two standout buildings, the Institute of Contemporary Art and District Hall, end up being the only two buildings in the neighborhood Bostonians enjoy looking at, it won’t be a fatal shortcoming. The neighborhood is styling itself after Cambridge’s Kendall Square, the poster child for the limits of the fallout from bad architecture. With its huge city blocks, blank walls, and dearth of nightlife, Kendall Square felt like an architectural disaster for years. But it has come alive recently, because the neighborhood’s landlords have invested in local retailers and restaurateurs; good retail has kept office workers in the neighborhood after-hours and made new residential development far more appealing. The lesson is that, although it’s good to have nice-looking buildings, it’s far more important to have a strategy for getting people out of those buildings and onto the streets and sidewalks. The Seaport’s real shortcoming hasn’t been a glut of glass-clad buildings, but the fact that the area doesn’t work as an urban neighborhood. It still has too many missing teeth, too many blank lots where buildings should sit, to make it work like an organic neighborhood. There are islands of great stuff all around it, like the brick warehouses in Fort Point, the restaurant row at Liberty Wharf, and District Hall, the restaurant and meeting space that serves as the Seaport’s main gathering space. But there isn’t enough in between these high points to connect them all together in a larger urban scheme. That’s why One Seaport Square looms so large. The two-tower complex will bring more than 800 new apartments, and 260,000 square feet of shops and restaurants, to a key block in the Seaport. It will fill in a huge physical gap between the Fort Point Channel and the Seaport World Trade Center complex. It will line two of the neighborhood’s main drags, Seaport Boulevard and Northern Avenue, with storefronts, and bring the retail grid north from Fort Point into the heart of the new Seaport. It’s no surprise that sidewalks in the Seaport can often be empty. Large stretches of empty lots mean pedestrians have no reason to walk the neighborhood. The new Seaport residences change that dynamic. But they will also fix the surrounding streets physically: One Seaport Square’s developers will soon be ripping up the concrete median along Seaport Boulevard and replacing it with greenery. “Today it looks desolate. There’s nothing pretty about it,” John Hynes, the Seaport Square developer, readily admits. As the district rounds out, he says, “It’s going to be warmer, greener, and more interactive.” It’s a work in progress. But it’s moving in the right direction.